Are you supposed to bring cookies to a party this week? Or how about bring in a treat for your child’s holiday concert? Yeah, I know how it is. Staying up late, setting up your stand mixer, measuring out all that flour, waiting for the cookies to be done before you load yet another tray. This holiday I am thinking pineapple and getting it done without the stress. A dear reader sent me this super fast treat that tastes really good and takes all of 10 minutes to put together. Voila! You have instant sweet party snacks! And, it even looks like you cooked something a wee bit. You buy a bag of mini pretzels, Hershey’s kisses, and some almonds. No measuring necessary. Simply heat up the kiss on the pretzel and stick on an almond and you are done. How do they taste? You get a salty, chocolate, crunchy flavor which is quite good. These are much better than those sugar cookies you can slice and bake (oh, yes, I have used those, too). If you are looking for holiday ideas that feature healthy almonds check out the California Almond board site here: California Almonds. There are some ideas from Joy the Baker that look delicious (much better than my pretzel, kiss, almond bites). I try to include nuts as much as possible in my cookies to add a layer of nutrition to the butter and sugar bomb. What is your holiday cookie fix when you don’t have a minute to spare? Preheat oven to 400 F. Lay pretzels on baking sheet, unwrap kisses and place on pretzels. Heat in oven for 5 minutes, take sheet out of oven, and push almonds into the chocolate. Serve when cooled or store for later in a plastic container. Okay I confess, I have made them with the Rolo. Think I will try using a high % cocoa bar broken up. Also thanks for the website to the California Amonds. Found a coconut pie recipe that I can redo to make healthier. To make these holiday treats, you could replace the almond with red and green (or blue) M&Ms. Or...maybe dried cranberries if you're trying to go healthier? I like this idea! Sometimes you can find Hershey's kisses that already have almonds in them and of course you could use really good quality chocolate covered peanuts. Our department's holiday party is tomorrow and I'm bringing cupcakes. 100% organic, real food cupcakes made from scratch using real grass-fed butter (which is actually very high in nutrients). Much better than the faux-healthy fake food. I have been hooked on super simple peanut butter cookies this fall. 1 cup PB (I use the peanut only crunchy kind), 2/3 c. Sugar, and 2 eggs. Drop by spoonfuls onto parchment lined cookie sheet and bake at 350. You can use Splenda instead of sugar if you're in to that kind of thing. These make a nice chewey cookie. Danielle - about how long do you cook them for? I love chocolate and pretzels together! One of my favorite combos! 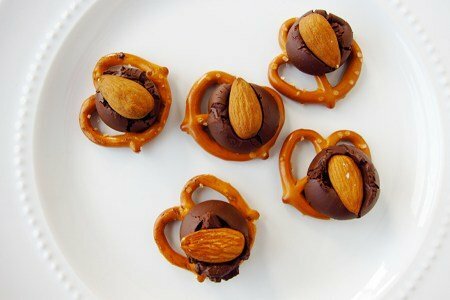 I've done these with Rolos and pecans for years, can't wait to try this version! You could probably make these even better if you use chunks of good dark chocolate instead of the kiss. My mom makes these with rolos and pecans. They're called "turtles". What's not healthy about dark chocolate and almonds?? Besides it's not like you are saying to eat all ten at one sitting. Alot better for you then a cookie. @ Sue- about 10 min. I often freeze the dough in ice cube trays then throw 6 in the toaster oven for my hubby & I. Thanks Danielle, I will be adding these to my Christmas baking list. Will also try them using Almond butter. Microwave chocolate chips in bowl on HIGH stopping to stir every 60 seconds until melted, (about 2 minutes).Stir in remaining ingredients. Drop by teaspoonfuls onto wax paper. Cool. 68 calories each-makes about 2 dozen. It has the sweet-salty-chocolate combo that I love! They are simple and look delish. I'm definitely trying these, thanks! Thank you, Snack Girl, you just saved me!